erine.email is a strong shield for your emails against spam. Based on unlimited disposable email addresses, erine.email is completely free, open-source, and simple. Really. Do you know the KISS principle? It states that most systems work best if they are kept simple rather than made complicated. erine.email is simple. Have 1 minute? Let me show you how it works. - I didn't get your email. - Have you checked your spams? Sounds familiar? Stop with obsolete spam systems. 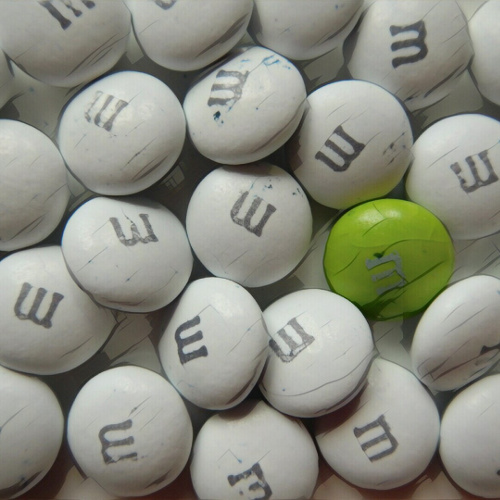 A system that you can trust has nothing to hide. erine.email is open-source. Not only the code. The whole architecture too. A username and your email address.That's all we need. 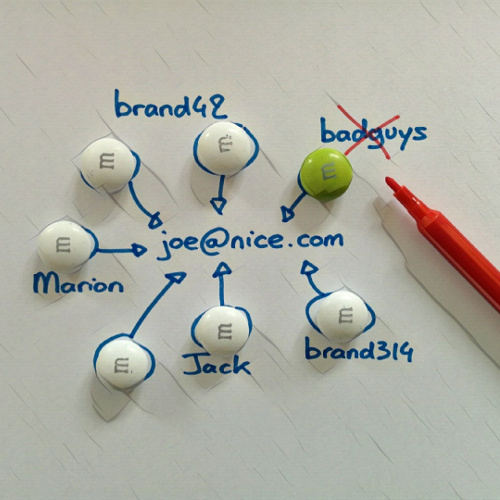 While registrating, I ask you to choose a username (let's say joe) and give your real email address (let's say joe@nice.com). The configuration part is over! 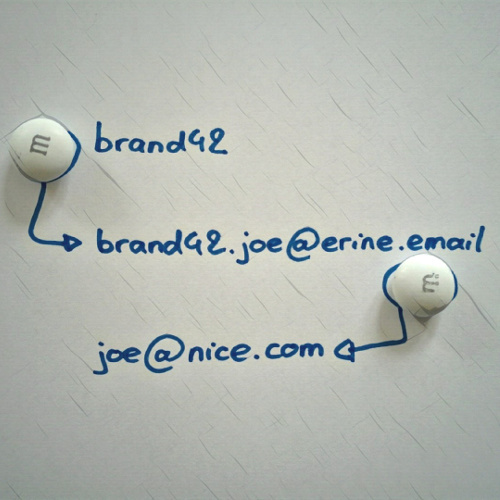 Now when the Brand42 shop asks for your email, answer brand42.joe@erine.email. All the emails sent to this address will be forwarded to yours. Brand42 will have no idea of your real email address, even if you reply to him. So you gave your brand42.joe@erine.email mail address to Brand42, jack.joe@erine.email to your friend Jack, and so on. Now, when one of your email addresses had been compromised (you can not unsubscribe a newsletter, the Badguys shop sold your email address to spammers, somebody hacked your friend's mailbox...), just disable it in your web interface. Yes. That means you will know who gave your email to spammers! No more false positive or false negative. Now that you're using erine.email, you simply disable compromised email addresses. That means you won't have spam anymore. As this system is efficient, you won't need your mail provider's spam predictor and can disable it with this simple rule: everything sent to something@erine.email is not a spam. Your spam folder will be empty, forever.